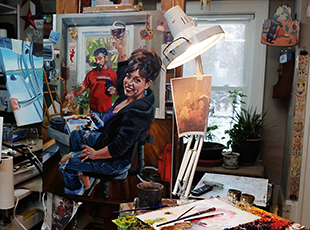 “Likeness,” curated by Heights Arts founding board member Sharon Grossman, brings together six Northeast Ohio artists who approach the portrait from different perspectives. They are playful with both point of view and materials, expressing information with color, texture, and medium. Rather than necessarily depicting the head and shoulders of the sitter as in the traditional definition of a portrait, these works delve into a deeper meaning of portraiture: images that reveal something of the character of the subject, sometimes in most unexpected ways. The following artists are showcased: Sarah Curry, painting; Susan Gallagher, ceramics; Bernadette Glorioso, painting on repurposed fabric; Dave King, mixed media drawing; Daniel Levin, photography; Mary Ann Tipple, fiber arts. One wall will be dedicated to self portraits by the artists. An accompanying gallery program, Ekphrastacy: Artists Talk + Poets Respond, will be held on Thursday, February 9 at 7:00 p.m. “Likeness” exhibition artists will speak about ideas and processes behind their works, as well as the challenges of creating successful self-portraits. Invited Northeast Ohio poets respond in poetry to select portraits in the exhibition as well. The community is invited to a opening reception for the exhibition and opportunity to meet the artists on Friday, January 13 from 6 to 9 p.m.